In each move, Nick can remove one integer from the top of either stack A or stack B.
Nick keeps a running sum of the integers he removes from the two stacks. Nick is disqualified from the game if, at any point, his running sum becomes greater than some integer given at the beginning of the game. Nick’s final score is the total number of integers he has removed from the two stacks. Given A, B, and x for g games, find the maximum possible score Nick can achieve (i.e., the maximum number of integers he can remove without being disqualified) during each game and print it on a new line. The first line contains three space-separated integers describing the respective values of n (the number of integers in stack A), m (the number of integers in stack B), and x (the number that the sum of the integers removed from the two stacks cannot exceed). The second line contains n space-separated integers describing the respective values of a0, a1, …, an-1. The third line contains m space-separated integers describing the respective values of b0, b1, …, bm-1. 1 <= n,m <= 100 for 50% for of the maximum score. For each of the g games, print an integer on a new line denoting the maximum possible score Nick can achieve without being disqualified. The image below depicts the integers Nick should choose to remove from the stacks. We print as our answer, because that is the maximum number of integers that can be removed from the two stacks without the sum exceeding . To be honest, I spent an hour on this problem and couldn’t find the optimal solution. Obviously, you can say that there is a brute force solution, but it takes O(2^k), k is the longest steps that can be achieved. Because for each step, we can either go with the top of A or B. Hence, we need two recursive call each steps, or two “branches” each steps. According to Cracking the Coding Interview, time complexity for these problems is O(branches^depth). 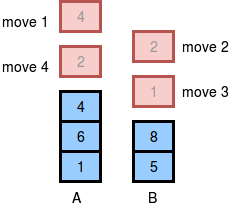 Replace depth with k, branches with 2. I was just thinking, to get the longest path, can we just chose the number from either A or B that from that point, we can continue with the furthest distance. Let say we can choose either 5 from A or 6 from B, if we choose 5, we can chop out 5 more elements in A, but if we choose 6 we can chop out 6 elements in B, hence we will choose B. This is short of a greedy solution, and greedy won’t yield optimal result all the time. So I click on the Editorial part. The editorial doesn’t tell you exactly what is the idea behind the solution, it just says “here is how you solve it”. I think until this point you can probably think of a solution, but if you can’t, let’s continue reading. + 5 top of A, 4 top of B. + 9 top of A, 0 top of B. + 8 top of A, 1 top of B. This is the solution in Java, it might not be the most elegant solution but it gets the job done. A little talk for my comeback! Hi every one, long time no see. It’s been a long time since the last time I did write some blogs. Recently I’ve just quit my job and I’ve been looking for a new one, so it’s about time to get back to problem solving. The best way to repair for coding test is to solve problems. The more problems you solve, the better and quicker you will perform. This time though, even if I get a new job, I’ll still continue keep practicing more and write more blogs. There are also some changes. For the “Problem solving” section, from now on, I will try to come up with the most elegant, succinct and easy to understand write-up that I can possibly think of. I consider myself to be an average problem solver, but no one is good without learning and practicing, right?